Secretary of State Rex Tillerson will host 37 African foreign ministers to Washington later this week in the largest African foreign policy event to date under President Donald Trump. U.S. Secretary of State Rex Tillerson will welcome 37 African foreign ministers to Washington later this week in the largest African foreign policy event to date under President Donald Trump. The event on November 16 and 17 will include discussions on trade and investment, counterterrorism, and good governance. In addition to the ministerial attendees, African Union Chairperson Moussa Faki Mahamat and other A.U. representatives will attend. Acting U.S. Assistant Secretary of State for African Affairs Donald Yamamoto told VOA's Africa 54 the goal is to craft policy that goes beyond aid to build mutually beneficial partnerships. Yamamoto said the meeting will focus on preparing for the future. By the year 2100, Africa is projected to be the most-populous continent in the world with 2.2 billion people. About 70 percent of its population is under 30, and this “youth bulge” can either be a blessing or a curse, depending on how the continent prepares. 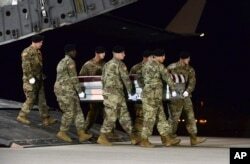 In this image provided by the U.S. Air Force, a U.S. Army carry team transfers the remains of Army Staff Sgt. Dustin Wright of Lyons, Georgia, Oct. 5, 2017, upon arrival at Dover Air Force Base, Delware. In the near term, the United States will continue to play a lead role in training African partner nations. U.S. forces have trained thousands of African soldiers in the past 10 years. Working with local partners, the United States has helped upgrade security and facilitate coordination across nations to guard against Boko Haram, Islamic State, drug trafficking and other threats, according to Yamamoto. In the long term, however, security will come from economic growth and prosperity, Yamamoto said. To ensure this, the United States wants to discuss strategies for reducing debt and eliminating barriers to trade within the continent. “If we break down non-tariff trade barriers and barriers that prevent trade from happening between the countries, then what we are going to see is not only expansion of investments in trade and opportunities, but also economic growth, and that could be the spark, the basis for other trade and development,” he said.